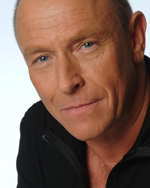 Corbin Bernsen comes from an entertainment family. His mother, who recently passed away, had been on the long running soap The Young and Restless for 35 years. A graduate of UCLA where he earned a bachelors degree in Theater and a Masters degree in Playwriting, he most recently starred as Henry Spencer on USA Network's hit original series PSYCH. He was first catapulted to stardom during the 1980s by the hit NBC TV series, L.A. Law. He was nominated for both Emmy and Golden Globe awards for his performance as Arnie Becker on the show that virtually created the ensemble drama as we now today. Along the way he hosted Saturday Night Live, and guest starred on Seinfeld and Star Trek to name a few notable television appearances. In the feature film arena, he starred in the comedy Hello Again, followed by other critically acclaimed roles in Disorganized Crime, Wolfgang Peterson's Shattered, The Great White Hype, and as the Cleveland Indians' third baseman-turned-owner Roger Dorn in the extremely popular Major League series of films. Other film credits include Lay the Favorite with Bruce Willis and The Big Year with Steve Martin, Jack Black and Owen Wilson. He also appeared with Robert Downey Jr. and Val Kilmer in Kiss Kiss Bang Bang. Recently, Bernsen has moved to the other side of the camera, directing the films Carpool Guy, Dead Air and Rust, which was distributed by Sony Pictures Entertainment. With Rust, Bernsen shifted his focus to family friendly movies and formed Home Theater Films. 25 Hill, which he also wrote and directed, is the first title from his newly formed company and was distributed by EchoLight Studios in July 2012. This was followed by 3 Day Test (2012) and Beyond the Heavens (2013), also released by EchoLight Studios. Bernsen latest project, Christian Mingle, was just released in January 2015 by Capitol. Bernsen lives in Los Angeles with his wife of 26 years actress Amanda Pays, and their four sons. RUST is Bernsen's first novel.